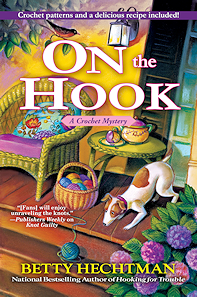 With the publication of ON THE HOOK there are an even dozen Crochet Mysteries. The usual question I get is where do I get my ideas. They come from everywhere. Even my own backyard in the case of HOOKING FOR TROUBLE. 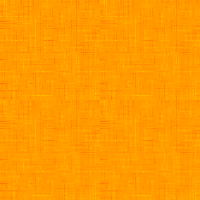 They can come from a piece of a conversation or someone I hear interviewed on television. Inspiration comes from my life as well. It's certainly true in ON THE HOOK. I used my experiences in a screenwriters workshop, in an acting class and in an improv comedy class in the book. I certainly met some interesting characters. People working on their dream are an emotional lot. I thought a woman in the screenwriting workshop was going to strangle me when I dared to offer a critique of the scene she'd brought in. It was a group activity and input was supposed to come from all of us, but apparently she only wanted praise. I took the improv comedy class on a dare. Standing in front of an audience and trying to get them to laugh is about the last thing in the world I want to do, though it turned out to be an interesting experience. I think I was the only one there on a dare. The rest of the class seemed to be there for a real purpose. There was a heavy woman with a familiar face who was a professional character actress who was taking the class to help her with auditions. A man in his forties who worked as a salesman was hoping to break into acting and was always talking about open auditions. There was a too cute couple who had hopes of being the next big comedy team. A tall guy who stuttered wanted to be a standup comic. And then there was the prim looking woman who never said why she was there. Like I said people working on their dreams are an emotional lot. So when the standup comic hopeful stood before the group trying not to stutter as he practiced a routine and used that phrase about the fat lady singing, the heavy set actress took it personally and threw a fit. And on the last day of class as the teacher was talking about the group finding a way to continue, the prim looking woman freaked out and started yelling obscenities at all of us and then stormed out of the room. It gave me a shiver because I'd been giving her rides to her car at night. Imagine if she'd freaked out while we were alone in the dark on an isolated part of the Pierce College campus. Along with being asked about where I get ideas, I get questions about my process. It is a lot less exciting than my experience mentioned above. It all starts with the first line. Once I get that it seems to open the door to the whole book and then it seems to come to me. I like to start writing in long hand. Eventually I type it into the computer, but there is something different about working with a pen and paper. For me, it seems to tap right into my imagination. Ideas show up that surprise me. I have read that you use a different part of your brain to hand write than you use when you type. It sure feels true to me. That's why I find it disheartening to hear that cursive writing isn't being taught anymore in some schools. An added benefit to handwriting is that it is so portable, needs limited supplies and doesn't need electricity or batteries to run it. And no I don't have a writing schedule or quota of words I write a day. Like Molly, my life is a little chaotic, so it's all by the seat of my pants for me. "If Hooks Could Kill" Now Available! Betty is the 'Friday Blogger' at Killer Hobbies ... she's one of five mystery writers who are dying to discuss the hobbies that drove them to murder! "A Stitch in Crime" was on the Barnes & Noble Mass Market Mystery Best Seller list for four weeks. "Hooked on Murder" was on the Barnes & Noble Bestseller List for 6 weeks! 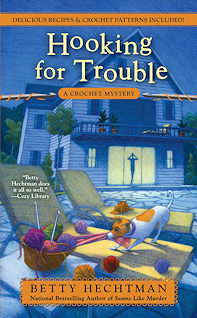 Betty's third Crochet Mystery "By Hook or By Crook" has been on the Barnes & Noble Mass Market Mystery Best Seller list for four weeks, and in the top ten on the Independent Mystery Booksellers Association Best Seller list for the entire month of June. "Dead Men Don't Crochet" was on the Barnes & Noble Mass Market Mystery Best Seller list for three weeks.